You are here: Home / Big Bear Buyers / Buying Or Selling A Home In Big Bear? 3 Critical Contingencies To Keep In Mind. Buying Or Selling A Home In Big Bear? 3 Critical Contingencies To Keep In Mind. The California Association of Realtors (C.A.R.) residential purchase contract (RPA) has three standard contingencies built into the contract – Loan Contingency, Appraisal and Buyer’s Inspections. Most of the problems that come up in a real estate transaction fall under these 3 contingencies. If the contract is left unchanged, the period of these three contingencies is 17 days after the deal is struck. 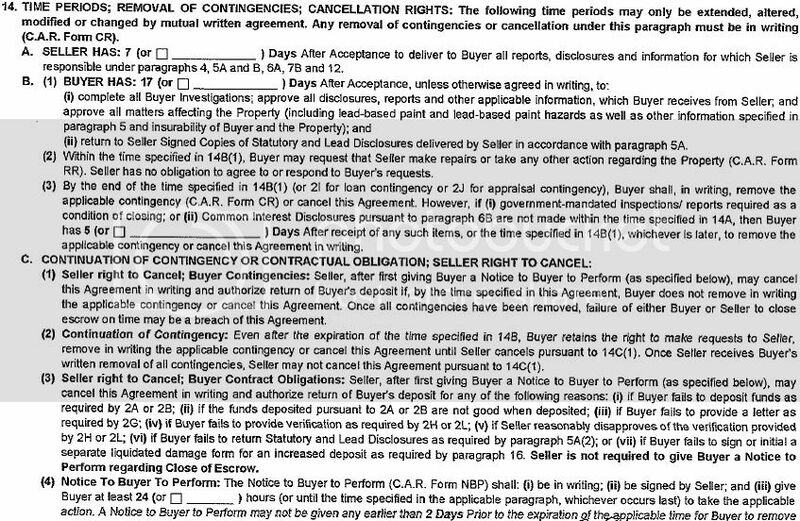 As stated in the contract, the removal of these contingencies must be in writing with the C.A.R. form CR (contingency removal). Loan – The loan contingency term should be set based upon the time that is required for the lender to provide written loan approval. The shorter the time period, the more attractive to the seller, but can the buyer and the lender live up to that? In today’s lending world, banks are very careful to check all of the borrowers information and be certain the buyer can service the debt. Often, the buyer’s agent will ask for the loan contingency to be extended until the loan funds. This is a good idea if you are a buyer, but sellers may not want to wait that long. Until the buyer removes the loan contingency, the seller and the deal are still in limbo. I would caution buyers to ask for at least an extra week (24 days) for loan contingency removal considering the current lending environment. Appraisal – Recent changes brought by the Home Valuation Code of Conduct (HVCC) have made appraisals an issue for some Fannie Mae and Freddie Mac transactions (basically any loan under $500,000). Lenders are now required to use an AMC (appraisal management company) to select the appraiser. Many times theses appraisers from outside the area with little or no local knowledge about the real estate values in Big Bear. This can be a problem, especially if the appraiser doesn’t have access to the local Multiple Listing Service (MLS). Usually, the appraisal contingency time period is left at 17 days. Buyer’s Inspections – Buyer’s inspections contingency period is 17 days unless you request a different time period on the residential purchase contract. Usually this is adequate time to perform a home inspection or any other inspections that a buyer may want to have completed. I recommend that a heating contractor takes a look at any forced air heating unit that is over 15 years old to check the heat exchanger for cracks, carbon monoxide leakage and to verify that there have not been any recalls on the heater. Buying or selling a home is best done with the advice of a real estate professional. Understanding the contracts and contingencies involved is just a small part of the whole process. Wow! 17 days! Better fill in the blank.